Over Memorial Day Weekend I went up to Boston to hang with my best friend Lauren. I wrote about my packing list here and even made you a bomb playlist. Unfortunately the weather in Beantown was less than ideal—but we did get a break of sun just when we needed it most. On the Saturday of our long weekend, we took a ferry over to Provincetown on Cape Cod. It wasn't "hot" by any means, but we did get to be sleeveless and wear sunglasses, so there's that. 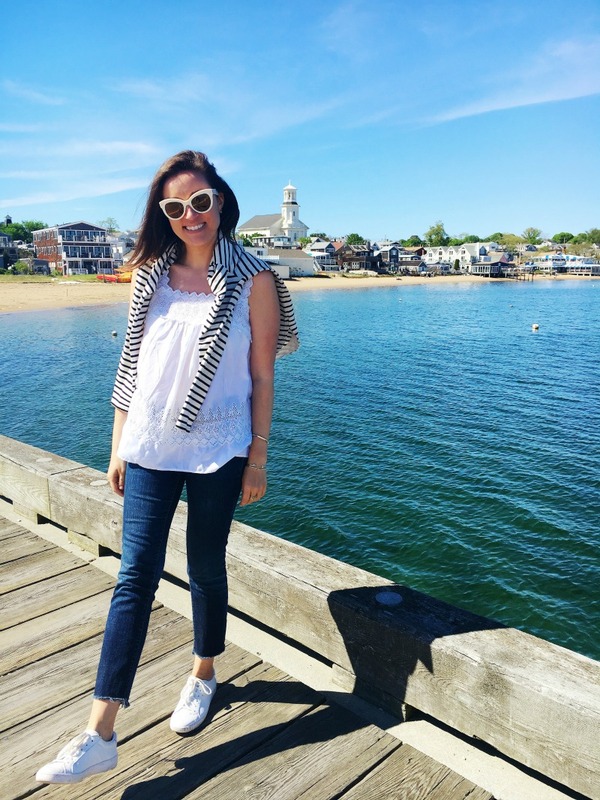 Since you know I love to lean into a theme, it shouldn't surprise you to know that I felt very inspired to channel my preppiest self for this little sojourn. I laced up my little white leather Keds (which look a lot like Stan Smiths but have a more slim, feminine look) and tossed my striped sweater around my shoulders. Also, I need to talk about this incredibly affordable white top from Old Navy for a second. I've found myself wearing it even more than I imagined—with jeans, shorts, skirts, whatever. It's sweet, comfy and so summery. It comes in four colors and I can't recommend it enough. Oh also—I'm still v v obsessed with my Kendall and Kylie sunglasses. They make me look cute in all my Instagrams and I appreciate that the cream frames and slightly reflective gold lenses make them less aesthetically abrasive and costume-y than a pure white pair of sunglasses. And if you happen to find yourself in Provincetown this summer? Rent bikes from Arnold's Where You Rent The Bikes (yes, it's really called that). You can cruise all around for a half day rate of $25 or so. Have lunch (lobster rolls, frosé and fried brussels sprouts) at The Canteen and try to snag a seat on their cool and casual back patio.